This evening I decided to use what I had on hand to make dinner. I had a big container of very ripe NatureSweet tomatoes on the counter that needed to be used and it was way too many to put on a salad. I also had a bag of Vidalia onions on the counter and some leftover cooked bacon in the fridge from earlier in the week. The plan just sort of came together. I decided a quick and easy frittata was in order. I halved about 2 cups of grape tomatoes, tossed them with olive oil, basil, oregano, salt and pepper, then placed them on a parchment lined baking sheet and popped them into a hot oven to roast for about 30 minutes. I sautéed a diced Vidalia onion until it was translucent and caramelized which enhances their natural sweetness. I cut up 6 slices of cooked bacon and then grabbed a bag of thick cut sharp cheddar cheese (Sargento's Traditional Cut) from the fridge. By the time the tomatoes were done roasting, I lowered my oven temp and whisked the eggs, half-and-half, tomatoes, onions and cheese together and poured it into my Calphalon oven proof skillet and then cooked it on the stove top for a few minutes and then popped it into the oven to cook for about 30 minutes until it didn't jiggle in the middle. The deep flavor of the roasted tomatoes, herbs, salty bacon, sweet caramelized Vidalia onions and sharp cheddar cheese was absolutely amazing. It was a satisfying and delicious meal and it used what I had on hand. What's even better is that I have plenty leftover to reheat for a quick and yummy breakfast tomorrow. This combination of flavors was so good but you could swap out the cheese for whatever you had on hand or use browned sausage in place of the bacon or whatever your heart desired. I snapped a few photos below and included the easy peasy recipe. Enjoy! Preheat oven to 400 degrees F. Line a baking sheet with parchment paper. Toss halved tomatoes in a medium bowl with olive oil, salt, pepper, oregano, and basil. Spread out in single layer on baking sheet. Bake for 25 to 30 minutes or until tomatoes begin to shrink up a bit, brown and caramelize. 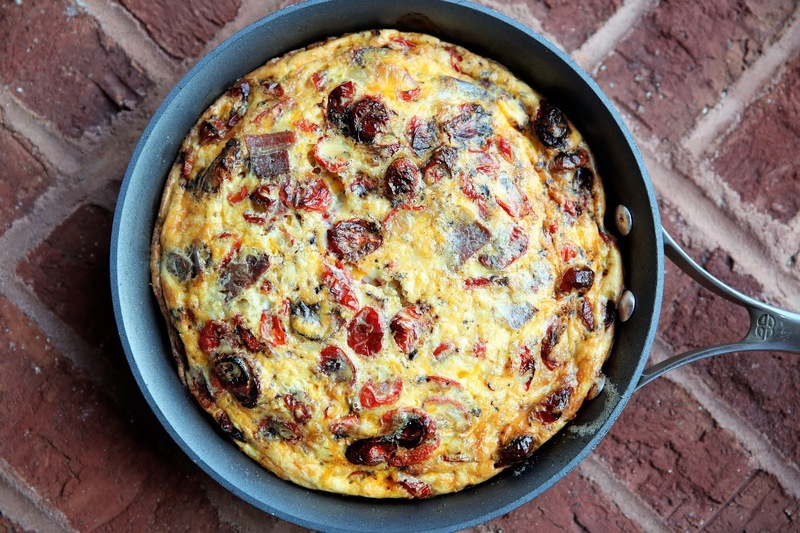 While tomatoes are roasting, add olive oil or butter to 10-inch oven proof skillet. Cook onions until softened and caramelized (golden brown). Set aside while preparing the frittata. Reduce oven temperature to 375 degrees F.
In a large bowl, whisk eggs and cream together. 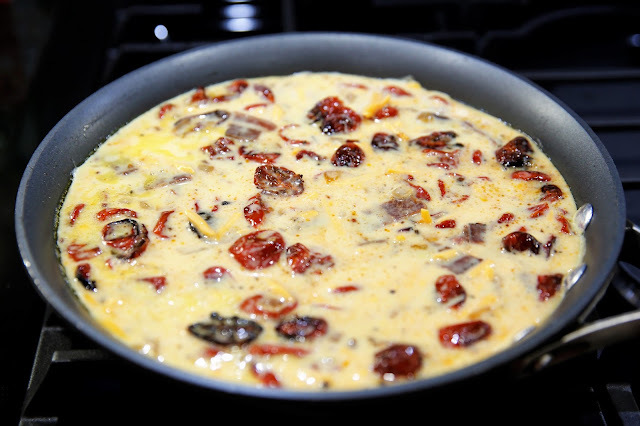 Stir in cheese, onions, bacon and roasted tomatoes. Heat greased 10-inch Lodge cast iron or other nonstick ovenproof skillet over medium-high heat until hot. Pour egg mixture into hot skillet and cook for 2 to 3 minutes (this hastens crust formation and keeps it from sticking to the pan). Bake in a 375 degree oven for 25 to 30 minutes or until puffed and golden brown. Awww ... but those little chipmunks are so c-u-t-e!